Mattresses have evolved over the years. In past years, mattresses were made of hair, feather, and straw. These days, mattresses are made of flexible polyurethane foams, innersprings, latex, and other products. In the last 10-15 years, there has been a major shift in awareness about mattresses and a consequent change in buying behavior among consumers. Growing health concerns, problems associated with sleeping disorders, and availability of attractive, stylish, decorative mattresses are the major factors driving the demand for mattresses globally. The applications of new advanced technology like Gribetz Batch Pro Panel Cutter, Sleeptracker technology in mattress production, and new product innovations have changed the scenario of the global mattress market, transforming the market from a low-growth market to a comparatively fast growing one. Currently, the market holds a broad range of products for consumers across all income groups and demographics. Another factor driving the growth of the mattress industry is the rise in construction activity. Both commercial and residential construction is on the rise globally especially in the U.S. owing to economic and political stability in the region. Housing and hospitality sectors are primarily supporting this growth. The commercial sector, which includes hotel industries, offices, and institutions, and healthcare industry among others has seen robust growth in the past few years and is expected to witness similar growth in the coming years. Apart from this, changing consumer trends in home renovation is also fueling market growth. Majority of homeowners are undertaking home improvements to refurbish and to add value to their houses. Remodeling homes is the most popular renovation followed by wallpapering, painting, and carpeting among others. Consumers spend lavishly on home renovation in developed regions such as the U.S. and U.K due to improved economic conditions. Demand for mattresses is expected to drive the growth of the market over the forecast period due to these factors. Other influencing factors such as new product offerings with added features through research and development are fueling the mattress market. Increasing obese population, growing prevalence of pressure ulcers, and rising awareness among consumers regarding health is propelling the demand for specially designed medical mattresses such as gel filled mattress, water bed mattress, and air filled mattresses. However, despite all these driving factors, high manufacturing cost of mattresses is anticipated to restrain the global mattress market. In the report, the mattress market is segmented by product type, mattress size type, mattress component, and by geography. Based on product type, the mattress market is segmented into memory foam mattress, hybrid mattress, innerspring mattress, and latex mattress among others. Others product segment includes gel filled mattress, air filled mattress, and water bed mattress. Based on mattress size type, the market is bifurcated into twin or single size mattress, twin XL size mattress, full or double size mattress, queen size mattress, and king size mattress among others. Others mattress size segment includes California king or king long size mattress and grand size mattress or super king size mattress, and athletic king size mattress. In terms of component, the mattress market is bifurcated into foam which includes Polyurethane Foam, Polyethylene Foam, Visco-Elastic or Memory Foam Gel Foam, Polyester Foam, Latex Rubber Foam, Convoluted Foam and Evlon, Innerspring or Coils includes Bonnel Coils, Pocket Coils, Continuous Coils and Offset Coils, Latex includes natural and organic. Fillings include coir, wool, and cotton, and ticking. Geographically, the mattress market is bifurcated into North America, Asia Pacific, Europe, and Rest of the World (RoW). Regionally, Asia Pacific accounted for the largest market share in 2015 and is anticipated to grow steadily due to increasing demand from leading markets such as China, India, and Australia. A growing urban population ready to spend extra for comfortable and luxurious spacious bedding accessories, accelerates the demand for mattresses in this region. In addition, a rising number of health conscious people are ready to pay considerable amounts for products which are beneficial to health in this emerging economy. Thus they choose good quality mattresses for sound sleep, leading to increased demand for mattresses. Innerspring mattress constituted majority share in terms of revenue in the Asia Pacific mattress market in 2015 and this trend is expected to continue over the forecast period. In India, the mattress market is highly competitive and dominated by leading players such as Sleepwell, Springfit, Springwel, and Kurlon. North America held the second largest market share in 2015. The U.S. and Canada have emerged as key mattress markets in North America. Rising incidence of sleep disorders in the U.S. and Canada and greater awareness regarding mattress durability is anticipated to drive growth of the mattress market in North America. Emerging economies of Latin America and Middle East are expected to take the lead in the adoption of different types of mattresses. In addition, increasing construction activities in the commercial and residential sector is further fueling demand for mattresses in Europe, Latin America, and the Middle East. Worldwide, the mattress market is set to display strong gains due to growth in emerging markets such as China, Brazil, Canada, India, and Germany. Key players in the mattress market include Tempur-Pedic International, Inc., Simmons Bedding Company LLC, Serta, Inc., Spring Air Company, Select Comfort, Southerland Bedding Co., Sealy Corporation, Kingsdown, Inc. King Koil, Inc., Zhejiang Huaweimei Group Co. Ltd., Silentnight Group, Relyon Limited among others. Sleep is a biological need that plays a vital role in maintaining metabolic homeostasis. Consumers are becoming aware of the importance of having good quality sleep as it helps in regulating metabolism, immune function, and influencing memory and other body functions. Demand for good quality sleeping mattresses has seen an increase in the past few years owing to these reasons, and the demand is expected to grow at a considerable rate over the forecast period. In past years, mattresses were made of straw, hair, and feather etc. Currently, mattresses are made of flexible polyurethane foam, latex, and innerspring among others. In the last few years, there has been a shift in consciousness about mattresses and people are ready to pay something extra on luxury bedding products to get comfort sleep. Growing housing, hospitals, and hotel industries are the major factors responsible for the growth in demand for mattresses globally. In addition, rising focus on good quality mattresses and bedding accessories for sound sleep is further propelling the growth of the market. Apart from this, increasing demand for customized and premium mattresses are promoting the growth of the market. Innerspring mattresses are the most popular mattresses among customers across the world. In some countries, memory foam and latex mattresses have observed significant growth and this market trend is expected to continue over the forecast period. Globally, demand for mattresses is on the rise with increased focus on interior design and associated home furnishing in different countries across the world. The mattress market has witnessed a drastic change, from a slow-growing sector to an innovative, stylish, and dynamic marketplace where a wide range of choice of mattresses is available for customers. In addition, celebrity brand partnerships promote market growth. Development of different types of mattresses such as latex mattress, hybrid mattress, memory foam mattress, and innerspring mattress is attributed to factors such as rising incidence of sleep disorders and growing awareness regarding the same. In addition, lower prices and greater durability of mattresses are some of the other demand driving factors for the mattress market globally. Under the scope of the report, the global mattress market is divided into four segments: (i) by product (ii) by component (iii) by size and (iv) by geography. Based on product type, the mattress market is bifurcated into memory foam mattress, hybrid mattress, innerspring mattress, and latex mattress among others. Others mattress type includes water bed mattress and air filled mattress. Based on component, the mattress market is bifurcated into foam which includes Polyurethane Foam, Polyethylene Foam, Visco-Elastic or Memory Foam Gel Foam, Polyester Foam, Latex Rubber Foam, Convoluted Foam and Evlon. Innerspring or Coils includes Bonnel Coils, Pocket Coils, Continuous Coils and Offset Coils, Latex includes Natural and Organic, Fillings includes Coir, Wool, Cotton, and Ticking. In terms of mattress size, the mattress market is segmented into twin or single size mattress, twin xl size mattress, full or double size mattress, queen size mattress and king size mattress among others. Others mattress size type includes California king or king long size mattress and grand size mattress or super king size mattress, athletic king size mattress. Among all these mattress size types, the queen size mattress is ideal choice for couples who are looking for floor space-friendly as well as cost-effective mattress. Based on geography, the global mattress market is segmented into North America, Europe, Asia Pacific, Middle East & Africa, and South America. In 2017, Asia Pacific held the largest share of the mattress market followed by North America, Europe, South America, and Middle East & Africa. Asia Pacific is the largest as well as the fastest growing market currently and the trend is expected to continue during the next six years as well. In addition, Asia Pacific is expected to maintain its leading position during the forecast period. The report also includes key developments in the mattress and mattress component market. Porter’s Five Force analysis which identifies bargaining power of suppliers, bargaining power of buyers, threat from new entrants, threat from substitutes, and threat from competition is also included in the report. Value chain analysis which shows work flow in the mattress and mattress component market and identifies raw material supplier services providers and distribution channels of this industry is also covered in the report. Incremental opportunity analysis identifies and compares attractiveness of segments based on CAGR and market share index across North America, Europe, Asia Pacific, Middle East & Africa, and South America. The same has also been provided for each segment i.e. by Product Type, by Component, and by Size. 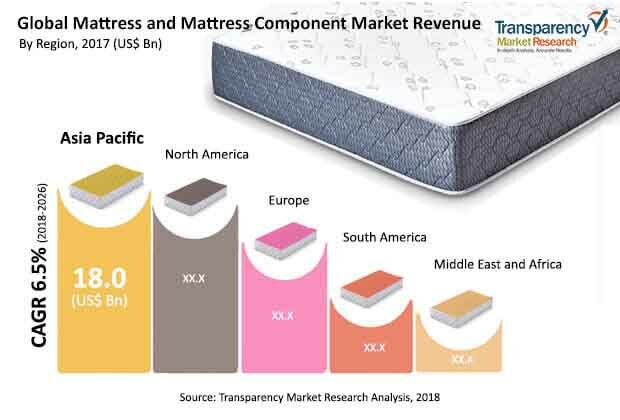 The report also covers the competition landscape which includes competition matrix, market share analysis of major players in the global mattress and mattress component market based on their 2017 revenues, and profiles of major players. Competition matrix benchmarks leading players on the basis of their capabilities and potential to grow. Factors such as market position, offerings, and R&D focus are attributed to a company’s capabilities. Top line growth, market share, segment growth, infrastructure facilities, and future outlook are attributed to a company’s potential to grow. This section also identifies and includes various recent developments carried out by leading players of the mattress and mattress component market. The report also provides company market share analysis of key players operating in the mattress industry. Some of the key players in this market include Tempur-Pedic International, Inc., Simmons Bedding Company LLC, Serta, Inc., Spring Air Company, Select Comfort, Southerland Bedding Co., Sealy Corporation, Kingsdown, Inc., King Koil, Inc., Zhejiang Huaweimei Group Co. Ltd., Silentnight Group, and Relyon Limited.